WintergraspLite is a very small, very light-weight addon which provides much more convenient access to the Wintergrasp timer. 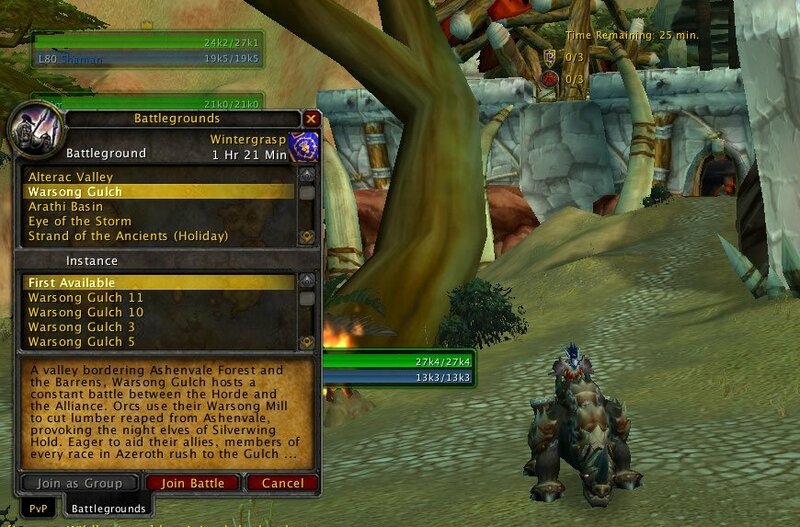 As a consequence of the above and the limitations imposed by Blizzard's code, you must first go to Northrend to see who controls Wintergrasp and you must be outside an instance to first get the correct time (although WintergraspLite does save between sessions, so if you disconnect while in an instance, you will still have the correct time when you log back in). That being said, once you know the time and control of Wintergrasp, you can leave Northrend or enter instances/battlegrounds and still be aware of this information. - Note: You may observe an occurrence of strange behavior when upgrading to the new version. The timer may not appear until you open the battleground window, and it may be in a strange location. Simply move it again to wherever you desire and this behavior will be resolved. - Fix: While I never ran into the problem, there may have been some issues with different timer positions between characters. This should now be resolved. - Fix: Reversed a change made in 1.0 that I assumed would help with updating Wintergrasp status. Instead of depending on unreliable events, WGLite will now update on a set frequency. This method appears to be much more dependable. I understand this may contradict the simplicity concept, but implementing an LDB feed would allow more options to the user regarding the display outside of the battleground queue window, and also get round the scaling issue in the process. Any easy way to make this scalable? It's a wonderful addon and looks great, but it ends up being a bit big compared to the rest of my UI. I'm not opposed to manually tinkering in the .lua to change the size, but I'd need to be pointed to what to edit. Didn't test it, so maybe it wouldn't work. And you could tinker with the values yourself, but let me know if you have any troubles. I'll see about adding an option in the future. can you make it hh:mm:ss format? and will it be accurate between sessions if ur logged out for say several minutes? As for your question, yes, it should. As for your request, I'm not sure if I really want it that way. I quite like how Blizzard does it, and it makes the mod simpler in that regard (I don't have to change anything). If there's enough requests for it, I'll probably put in an option to change it. Last edited by Codex : 11-25-09 at 09:48 PM. hmm...this time I drag the timer out of the bg frame, and it works well. So it's kind of my own problem cause I just wanna the timer stay in the bg frame...Thank you again for this useful addon, and for spending time on my own problem. [Edit] Nevermind, I think I found the problem. Going to push a fix in the next couple days. Last edited by Freki : 10-26-09 at 05:30 PM. yep. I don't know why but sometimes it shows nothing in the bg frame. Then I have to reload(/console reloadui) to get it back. That often happens after I leave the battleground. Hm.. strange. I'll be sure to take a look into it. Thanks for reporting the issue. It's small but very useful! Thank you! But sometimes the timer disappears and show up again after I reloadui. Is there any way to fix this?